Lud-in-the-Mist is another 1920s fantasy republished for modern readers as part of Gollancz’s Fantasy Masterworks series (contemporaneous works include The Worm Ouroboros, The King of Elfland’s Daughter and The Well of the Unicorn, which last volume I recently read and enjoyed). 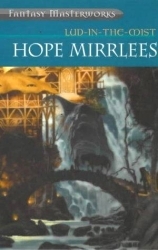 Mirrlees only wrote two other novels, neither of them fantasy. This volume enjoyed a revival in the 1970s, much the same as did The Lord of the Rings – hippies apparently liked the drug-taking theme. Neil Gaiman provides an introduction wherein he practically orgasms over the book – as well as giving away much of the plot. The book has the feel of a Victorian fairy tale and concerns a made-up nation with Dutch and English characteristics called Dorimare. Dorimare borders the Elfin Hills, beyond which live fairies. These fairies largely have no contact with the Dorimarites, except for occasional bursts of fairy fruit smuggling. Fairy fruit afflicts the eater with an otherwordly ennui that often results with them running away to live with the fairies. Dorimarites hate and fear fairies so much that even talking about them is taboo; people prosecuted for smuggling fairy fruit are officially charged with trafficking silk. The story revolves around Nathaniel Chanticleer, the lord mayor of Lud-in-the-Mist, capital of Dorimare, and the various fey goings on that affect him, his family and the whole nation. Eating the fairy fruit has biblical connotations, but it also has a narcotic resonance for modern readers. While the inhabitants of Dorimare generally regard its consumption as an evil, it is ultimately portrayed in a quite effective ambiguous way. The fairies never really come into the foreground of the story, instead occupying the shadows, disguised and appearing in hallucinatory glimpses. Instead, the story is firmly about the people of Dorimare, their desires and fears, their class tensions, their secrets. The novel is part fairy tale, part psychological fantasy; it even becomes a detective story for a few chapters later in the book. It has a gentle, didactic style to it; it makes you imagine the story being narrated by a Victorian nanny to her wards. It’s a little slow to get going – the first couple of chapters are strictly for scene-setting, describing the country and its ways. It gets bogged down a bit in places and some subplots don’t add much to the overall story – I’m thinking specifically of the disappearance of Chanticleer’s daughter and her classmates. However, Lud-in-the-Mist is a very likeable story that stays in the mind because of the amibiguousness of its antagonists and of the Dorimarites’ relationship to them, and because of its engaging central character.